Flooding in basements and crawl spaces is common in homes new and old, and they're rarely a one-time occurrence. Once water has flooded through your foundation, you can be certain that it will happen again. 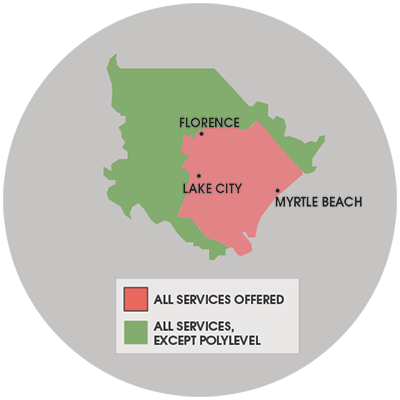 We offer free waterproofing quotes in Sumter, Florence, Myrtle Beach and many areas nearby. Call or e-mail us today to schedule an appointment! Once the foundation has been built, some of the excavated soil is used to fill in the gap around the outer edge of your foundation. This soil, known as "backfill", will be loose and fluffed from the excavation. Meanwhile, the untouched soil around it, known as "virgin soil", may have been settling for hundreds, even thousands of years. As hydrostatic pressure builds against your foundation, water will work its way into your basement or crawl space in any way possible. Water can make its way through concrete cracks in the walls or floors, through openings around pipes, through basement windows, or even directly through the porous concrete. If you have block walls, water may pass through the block and begin to fill the open cavities inside your walls. However, the most common way that water enters a home is through the foundation wall-floor joint. We find that most flooded basements start with a leak here, where the floor and wall meet. Since most basements flood from the wall-floor joint, one of the most common ways to stop the flooding is to install a perimeter drainage system along the edge of the basement floor. This would collect the water and direct it to a sump pump, which would then discharge it out of your home. However, at Best Home & Property Services, we have an approach to solving water problems of all types. Our solutions cover all surfaces of the basement, including the foundation walls, basement floors, and even wet crawl spaces. We offer free basement waterproofing estimates in North Carolina & South Carolina, including Camden, Florence, Gaddysville, Loris, Marion, Myrtle Beach, Rembert, St. Matthews, Sumter, Tradesville, Trio and many areas nearby. Contact us today to get started!